Dover, Del. (Mar. 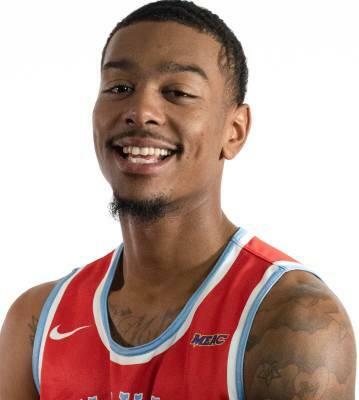 27, 2019) – Delaware State’s Kevin Larkin (Sussex Tech) has been selected to participate in the 2019 Dos Equis 3X3U National Championship, scheduled for April 5-7 at Minnesota’s Mall of America. Larkin is one of four players selected from the Mid-Eastern Athletic Conference selected to compete in the event. Larkin, a 2018-19 All-MEAC Third Team selection, was tops on the Hornets and fourth in the MEAC in scoring at 16.0 points per game, and was third in the league in rebounding at 8.9 per game. In addition, he was tied for second in the conference with 11 “double-doubles” this past season. On Dec. 3, 2018 vs. Cairn, Larkin scored a career-high 40 points, the top single-game total in the MEAC this season. He also had 11 rebounds, six assists and four steals to lead the Hornets to a 102-66 victory in that contest. Larkin reached double-figures in scoring in 20 of the 24 games in which he competed, topping the 20-point mark five times. His season was also highlighted by the game-winning basket with 3.4 seconds left to play in the Hornets’ 73-71 victory at Delaware on Dec. 19. A native of Georgetown, Del., and product of Sussex Tech High School, Larkin attended Cheyney University (Pa.) and Niagara (N.Y.) before returning to the First State to attend DSU and compete for the Hornets this season. Larkin is the second Hornet selected to compete in the national 3x3 tournament in its two years. DSU Artem Tavakalyan was a member of the MEAC squad that reached the final four of the 2018 tournament in San Antonio, Tex. All games of the 2019 Dos Equis 3X3U National Championship will be carried live on Twitter or ESPN2. Pool play will begin at 3 p.m. ET on April 5, with 24 games streamed live exclusively on Twitter. Pool play will continue on April 6 at 9:30 a.m. ET with 24 more games streamed live exclusively on Twitter. Round of 16 and quarterfinal games will be streamed live exclusively on Twitter at 10:30 a.m. ET on April 7, with semifinal, consolation and championship games televised live on ESPN2 later that day at 3 p.m. ET. Returning to call all the action throughout the tournament will be the voice of FIBA 3x3 basketball, Kyle Montgomery, with Robbie Hummel of ESPN and Tate Frazier and Mark Titus of The Ringer’s One Shining Podcast providing color commentary and sideline coverage.